This is the story of Avshalom Feinberg and Sarah Aaronsohn. 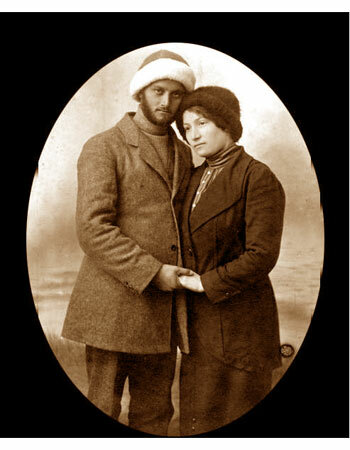 A photograph of Avshalom Feinberg and his fiancée, Rivkah, who was Sarah's sister, is available here. 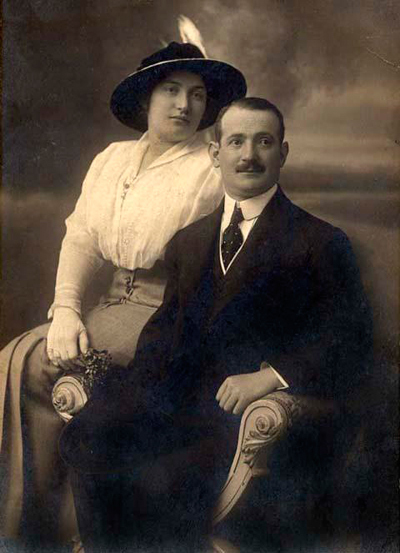 This is a photo of Sara Aaronsohn and her husband Haim Abraham. Sarah Aaronson and her husband Haim Abraham, as newlyweds, Spring, 1914. Amongst the many and varied trees on the Mt Herzl military cemetery is one lone palm tree  and that replanted form its original spot in the Sinai desert. This is the famous "Palm of Avshalom". I attended a memorial service for this extraordinary young man who gave his life for his people and for a free Jewish country  thirty one years before the state was established. It was still a dream in the hearts of many but a reality waiting for some help from Avshalom. Avshalom Feinberg was born in the year 1890 in the early Jewish settlement of Hadera near Israel's northern coast. Very poor, neglected lands, the kind that Hadera struggled with, were purchased by the Zionist agencies from very willing Arab absentee landlords. They could not believe there would be buyers for the malaria infested, stubborn soil. However with the increased violence against Jews in Europe and the awaking of the Zionist movement, Jews were returning, determined to cajole the promised land to fulfill its promise to its children. Avshalom's parents were the first wave of the agricultural return to the land. Their generation braved the constant malaria, drought, locusts, Arab violence and the sadistic Turkish government's brutality. But they persevered and put down stakes for the next generation. Avshalom's parents were part of the "First Aliyah", the first wave of Jewish farmers who breathed the first breaths into the dormant land. As the Talmud teaches, "the land of Israel is acquired through hardships".. But there was one hardship that Avshalom and his companions would not bear, the humiliation of Turkish rule. Almost four hundred years of Turkish rule was enough. World War I was the opportunity for change. Indeed. Many steps were taken by the warring powers for victory at any cost  even making false promises. The Balfour Declaration of 1917 declared that Britain, after ousting the Turks, would grant the Jews a state in their ancient homeland. A two thousand year dream come true! The children of the first settlers were about to play their role. Avshalom and a small circle of friends had their mission. Most of his neighbors and of the Jewish community were just too afraid of the brutal and now desperate Turks to even think of acting against them in any way. In fact many opposed other's efforts for fear of raising Turkish anger against the whole community..
Avshalom and his friends established "NILI", the acronym for 'The eternal One of Israel never lies" (Samuel 1:15:29). Under the guise of scientific research, the renowned Agronomist, Dr. Aron Aronson, used his experimental station on the coast as the base of the spy ring that delivered vital information to the British on moonless nights. Avshalom was 'hired" as his assistant and they were the eyes and ears of the British behind the Turkish lines. Indeed after the war in 1919, former British Chief of military intelligence, Major General George MacDough said, "the information that NILI provided saved up to one hundred thousand British casualties in the Turkish campaign". Not often do so many owe so much to so few. Avshalom was not only a brave patriot but a true "Renaissance man". Fluent in five languages, he was as welcome in French universities as in Bedouin desert tents. He was a prolific writer and poet and a skilled horseman and shot. But most of all he is remembered by those who knew him, as a "mentch" a kind and considerate person. Vital information did not have a very long shelf life. NILI had to get the information to the British as soon as possible. German submarines prevented British ships form nearing the coast to rendezvous with their Jewish volunteers. Carrier pigeons were used and finally Avshalom decided to brave it through Turkish lines to reach the British advancing in the Sinai desert. His NILI comrade and soul friend, Sarah Aronson [Also translated as Aaronson, Aharonson, Aharonsohn] gave him her prayers and some dates for the journey. They posed for a (last) photograph together before he mounted his horse. Something about that photo said. "this is the last one". When a carrier pigeon was intercepted by the Turks and it was not long before the town in which the Aronsons lived, Zichron Ya'akov, was surrounded .. They were looking for Sarah.. All the shutters shut fast and the streets became deserted.. Sarah knew they had come for her as she stood, waiting for them calmly in her front door. Her elderly father was tortured before her eyes. She insisted she worked alone and her father knew nothing. Enduring unspeakable tortures, Sarah's only words for her tormentors were what she thought of them. It was decided that the really expert torturers in Damascus would make her talk. Before being taken from her beloved Zichron Ya'akov she asked permission to change her blood stained dress. As she entered her room she managed to access a pistol with which she attempted suicide. 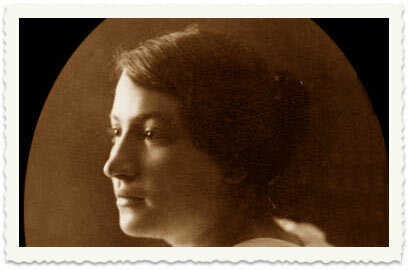 While she suffered in her near death state, the Turks threatened doctors to revive her or else. Even Turkish threats did not save Sarah. After four days of hell she returned her soul - just as she prayed for. Mortally wounded, the Turks arrived on the scene and a Turkish bullet finally killed the NILI emissary. He was buried in a shallow sand dune and forgotten. In June 1967, forty years later, Israeli troops stormed the Sinai, routing the Egyptian army. A local Bedouin offered information that he said would interest the victorious Israeli soldiers. They were led to the kubr yehudi (the "grave of the Jew".) What they were led to was a lone palm tree. The Arab began digging below the tree and alas, tangled together with the roots were the remains of Avshalom. The dates that Sarah gave her soul mate forty years ago for his journey sprouted in his pocket. With his remains were crumbling letters. His last to Sarah. After Avshalom, Sarah,and and friends the British were finally forced to leave, after perfidiously going back on their word to that noble generation. Yet another generation of dreamers and heroes had to oust the British from their land. They were flogged, imprisoned and hanged by the British  in the very same Turkish jails of a generation earlier. That is why I attended the memorial next to the lone palm tree in Jerusalem. There are some wonderful photos of the Feinberg family as well as the Belkind and Hankin families -- all from the first days of modern Zionism some 100 years ago --- Part 1 here. and Part 2 here. Part 2 has more information on the NILI. Shalom Pollack is a veteran Israel tour guide and producer of the DVD, Israel: Ancient Roots, Modern Miracle. Contact him by email at Shalompo@yahoo.com He will be making his annual U.S. speaking tour from November 22-December 22 featuring his film and PowerPoint presentations. If you would like to invite Shalom to your community, please contact him via his website, www.shalompollacktours.co.il.